In this paper an impulse-based method for cloth simulation is presented. 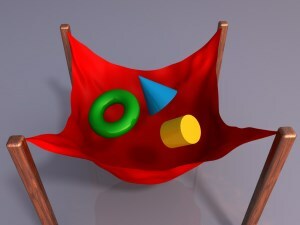 The simulation of cloth is required in different application areas like computer animation, virtual reality or computer games. Simulation methods often assume that cloth is an elastic material. With this assumption the simulation can be performed very efficiently using spring forces. The problem is that many textiles cannot be stretched significantly. A realistic simulation of these textiles with spring forces leads to stiff differential equations which cause a deterioration of performance. The impulse-based method described in this paper solves this problem and allows the realistic simulation of inelastic textiles.